Whether we struggle with mental health, physical health, or stress in our everyday lives, we often find that we get “caught up” in our struggles and have a difficult time focusing our time or energy elsewhere. We may even try to ignore these stressors, only to feel even more frustrated when our attention shifts back to what troubles us in the first place. Fortunately, people who participate in Mindfulness Training develop skills to effectively cope with the myriad issues that cause distress on a regular basis. 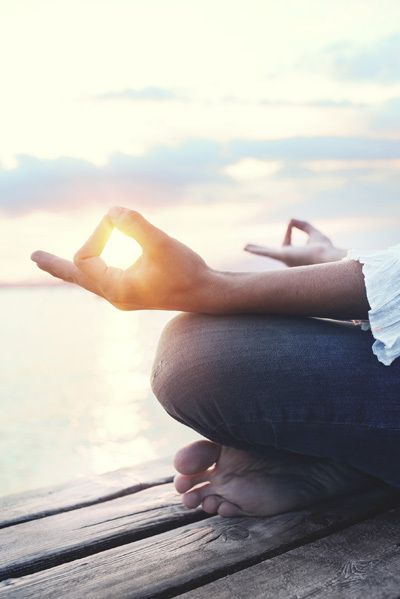 According to experts in the field, mindfulness is defined as “paying attention to something, in a particular way, on purpose, in the present moment, non-judgmentally” (Kabat-Zinn, 2003). When we focus our attention to the present moment, we spend less time focusing on what ails us. We also learn to more easily accept distress. For example, those who suffer from anxiety or depression often feel that their symptoms are unbearable and feel extremely negatively toward any sensation of anxiety or depression. Through mindfulness training, these individuals learn to appraise their symptoms as “just another experience” that is tolerable and manageable, without spending undue time focused on how much they dislike their symptoms. Mindfulness training is easy to learn and implement in your daily life. Without knowing it, you may already engage in mindfulness practice. If you make art or music, you may notice that you are fully involved in the creative process, without much (if any) focus on anything else. If you cook, you may notice a similar process while you cut, measure, and prepare your ingredients. The same holds true for athletes in the heat of competition. You might notice that when you are fully engaged in these kinds activities, your attention is only focused on the present moment—the task right in front of you. Mindfulness training essentially aims to recreate this sensation over a broader set of circumstances in our lives. What Will You Learn in Mindfulness Training? • You will learn a more in-depth understanding of the definition of mindfulness. • You will learn why mindfulness is so effective for managing mental and physical health. • You will learn a number of brief, simple techniques that you can easily incorporate into your daily routine. • You will learn how to apply these skills across a variety of settings, including at home, at work, or even in your car. • You will learn how to appraise negative sensations (internally or externally) in a non-judgmental way, making it easier to deal with our distress and frustration. How Can Mindfulness Training Help Me?